Today I got a little further on my latest project. 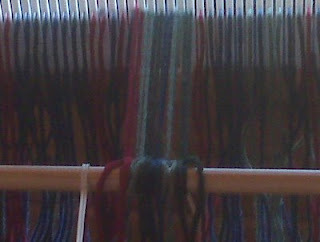 I have gotten the loom warp threads strung, and am ready to start adding the weft. 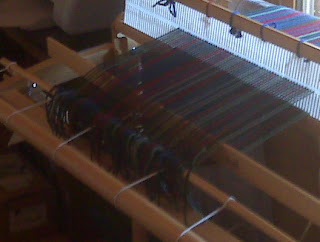 For those of you non-weavers out there, the warp threads run longitudinal, while weft runs selvage to selvage. This is probably going to be one of my last projects with acrylic yarns. I've stuck with them up to now, using up stuff I have, practicing my skills. I am looking forward to working with wools, and trying patterns and felting. Here is my looming spot, looking out the front window. Partially knotted. You can see that I have not filled the entire headle, this piece will be narrower than the last. There is also no pattern to this piece, I thought it might be interesting to do something a little more abstract. These are all my favorite colors. Cranberry, hunter green, navy blue, celadon -- should come out really pretty. I got to this point and the cat could no longer contain herself. All those lovely yarns hanging down, begging to be played with. I had to lock her up for half an hour, during which she was pretty vocal. You can see below where I have a pattern stick wedged in the shed. 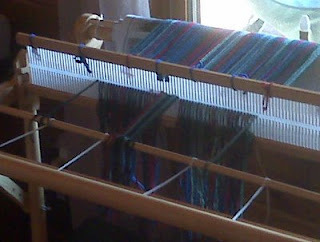 This is a rigid headle loom, and the headle is also used as a beater. Now I am ready to load and throw my shuttle. Wow! That looks so cool and interesting. You don't use the headle as a CAT beater, do you?